The story in yesterday’s Wall Street Journal on the link between gasoline prices and crude oil prices was a bit frustrating. The article does a reasonable job explaining key pieces of the puzzle, but then fails to assemble the puzzle into something resembling reality. The story is headlined, “Gas Stays High as Oil Drops: Prices at the Pump Have Yet to Reflect the Substantial Decline in Crude Futures,” and the first sentence repeats the theme: “U.S. crude-oil prices have hit the skids, but drivers aren’t feeling the impact.” The next couple of sentence fill in some details. In brief, the story says, the benchmark crude oil price is down nearly one-third since April, but U.S. gasoline prices are only down about 13 percent. The mystery of the just-down-13-percent gasoline prices is almost entirely created by trying to treat the NYMEX price as the relevant benchmark, but it isn’t. (As noted here in February.) Currently the Brent price is a better indicator of the world oil market price for crude oil. Our story here, then, is that world oil prices have dropped 18 percent since April while average gasoline prices dropped 13 percent. Hardly a different warranting a headline. The reporter fully recognizes this point, as he explains, “gasoline prices on the East Coast and even in the Gulf Coast track the price of Brent crude, which analysts view as a better indicator of global prices than Nymex. While Nymex futures are down 30% since April 29, Brent is down 18%.” And the story is accompanied by a graphic, above, which graphically illustrates the point that Brent seems to be the relevant reference point. 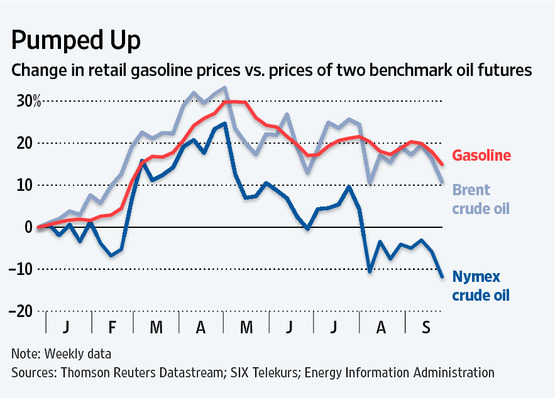 So why the struggle to cast this story about gasoline prices that are not falling fast enough?